Frederic Church is well-known as a painter, but he was also a world traveller, a family man, and a self-taught architect, farmer and landscape designer. He and his wife Isabel were pious, wellread, and funloving. They raised four children at their estate overlooking the Hudson. Though Frederic and Isabel Church moved among New York City’s cultural tastemakers, Olana was their primary home. A descendant of one of the Puritan families that founded Hartford, Connecticut, Frederic Edwin Church was born there in 1826 to Joseph and Eliza Janes Church. Frederic Church was raised in a Congregationalist household, the son of a silversmith with interests in milling, insurance, real estate and railroads. Showing early artistic talent, Church’s parents arranged for him to study with Thomas Cole in Catskill, New York. Cole had already established himself as an important landscape painter, and Church studied with him between 1844 and 1846. 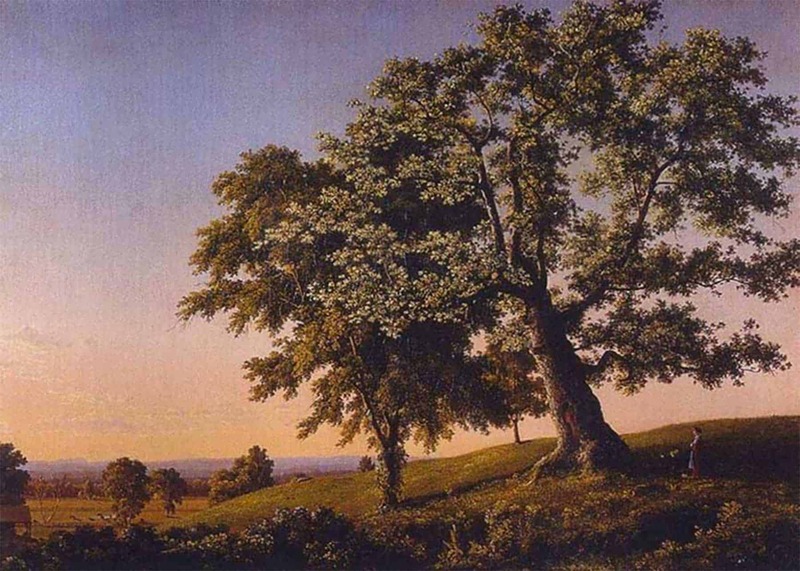 The two spent time in the studio and in the landscape, and a twilight scene on the Catskill Creek painted during this period by Church can be seen at Olana. Church moved to New York in 1847 and began his independent career. Travel became a constant in Church’s life, as he sought out specific locales and topics to paint. He crisscrossed New England, and Olana has canvases depicting Ira Mountain, Vermont, Bar Harbor, Maine, and the Charter Oak in Hartford, Connecticut. He went further afield to Labrador to see icebergs, and to South America, in 1853 and 1857, along the cordilleras of the Andes, to see equatorial volcanoes. While still in his twenties, he achieved great success at the exhibitions and sales of the American Art Union and the National Academy of Design, and attracted important patrons, like Cyrus Field, inventor of the transatlantic cable, and John Taylor Johnston, a railroad tycoon. Even when Olana became his primary residence, Church maintained an active presence in New York City, where he was a part of the art community. Like many artists, Church, was a member of the National Academy of Design and the Century Club, and had a studio in the 10th Street Studio Building. On January 10, 1860, the Boston Evening Transcript reported that “Church has been successfully occupied with another Heart than that of the Andes.” This was a coy acknowledgement of Church’s engagement to Isabel Mortimer Carnes, a young beauty from Dayton, Ohio. The two were married later that year. Church purchased 126 acres of hardscrabble farmland on a south facing hillside a few miles south of the town of Hudson, a sketching spot he had visited twenty years earlier in the company of Thomas Cole, his teacher. Although Cole had died in 1848, his family still lived just across the river, in Catskill; the property was (and is) visible from the hillside. Frederic and Isabel boarded with the Cole family while working with architect Richard Morris Hunt to design a small house. They called it “Cosy Cottage” and the couple moved in by the early summer of 1861. 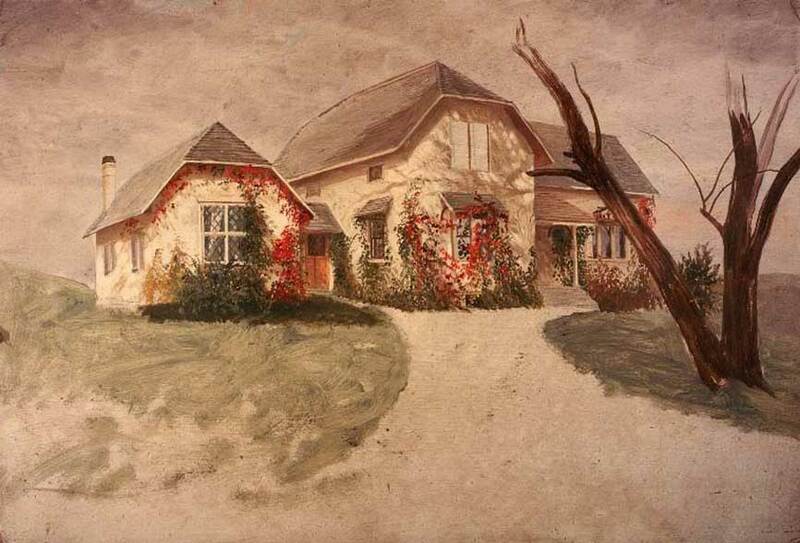 Acting as both a farmer and a landscape artist, Frederic set about improving the land. He planted crops, established a dairy herd, transformed a swampy area into a lake, and planted thousands of trees. He built a studio on the highest point of land he then owned, and there he made sketches of the views and worked on larger compositions. Frederic and Isabel’s first child, Herbert Edwin, was born in 1862, and their second child, Emma Francis, was born in 1864. While Frederic made frequent trips to his New York City studio for business, the two children were raised on the Farm, as the property was then called. Though Church did not fight on the battlefield in the Civil War (like most men of his age and class, he probably paid a substitute) he was deeply affected by the conflict. Many friends did enlist, including novelist Theodore Winthrop and painter John Jamieson, who were both killed. Church and his wife were to name one son after Winthrop, and a painting by Jamieson still hangs in the house. Scholars connect one of Church’s most famous paintings, “Twilight in the Wilderness” (1860, Cleveland Museum of Art) with its fiery skies, to Church’s anguish about the War. Tragically, the Churches’ two young children died in March of 1865 of diphtheria. The grief-stricken parents spent six months in Jamaica. “Sunrise” and “Moonrise,” painted to commemorate the births of the children, both now hang in the Sitting Room. In the autumn of 1867, Frederic and Isabel Church embarked upon an 18 month trip to Europe and the Middle East, to see the old world and the ruins left by ancient civilizations. They made lengthy stays in Rome, Beirut and Jerusalem. 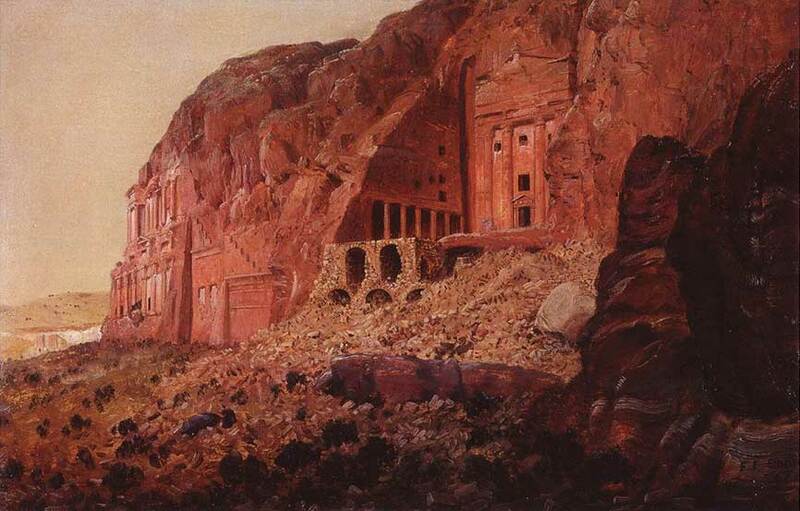 Church arranged a camel-caravan to Petra, the ruins of an ancient Nabatean city in the desert that was then controlled by dangerous Arab tribesmen. Vivid sketches of Petra’s colorful pink sandstone cliffs still enliven the walls of Church’s sitting room, and a large canvas depicting “El Kahsné,” Petra’s mysterious tombtemple, hangs above the fireplace. The couple’s trip to Jerusalem and various biblical sites was especially meaningful for them, and the Holy Land also became a subject for Church. 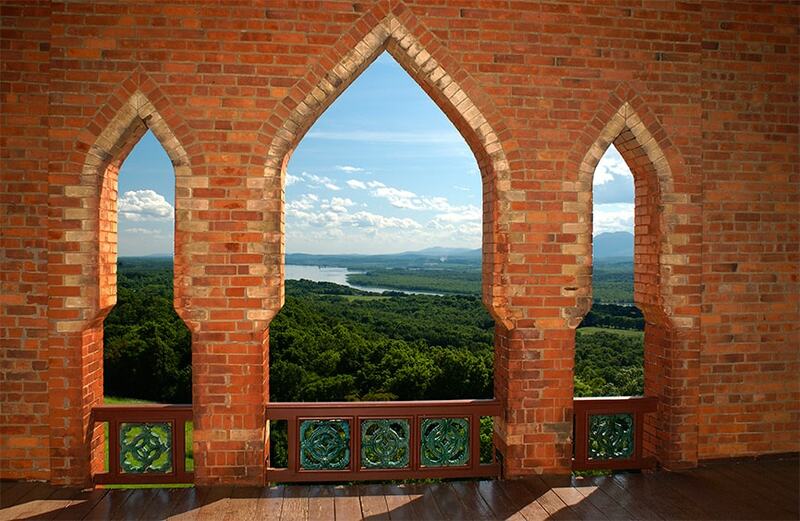 In 1866 the Churches opened a new chapter in their lives with the birth of a son, Frederic Joseph, and the purchase of an additional 18 acres of land at top of their hill, securing magnificent views across the Hudson River Valley. The Churches planned a new house on the site. Before building, however, the family made a long trip abroad, where they were inspired by MiddleEastern architecture. Another son, Theodore Winthrop, soon known as Winnie, was born in Rome in 1869. 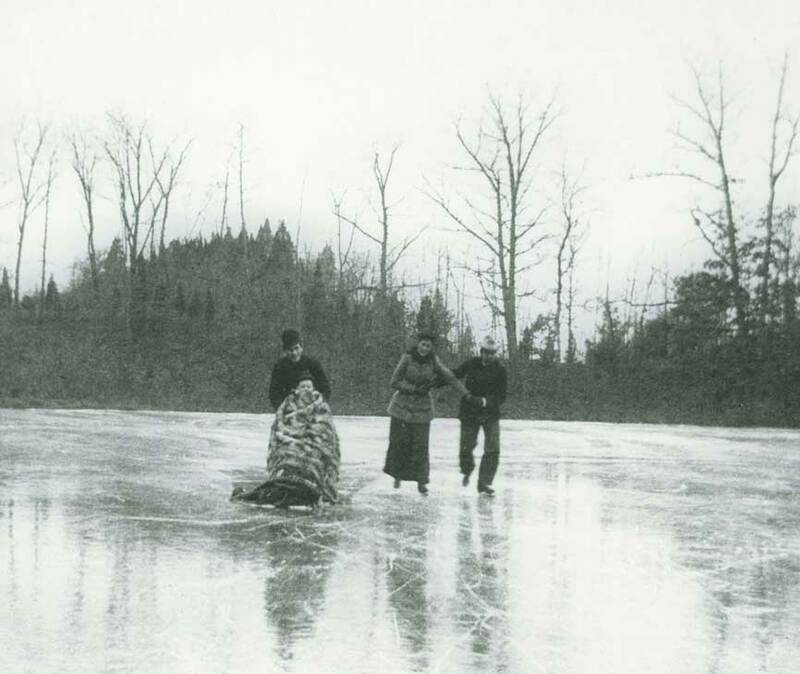 The family returned to the farm in the fall of 1869. Louis Palmer Church was born in 1870, and a girl, Isabel Charlotte, immediately nicknamed “Downie,” was born in 1871. These four children were raised at Olana. 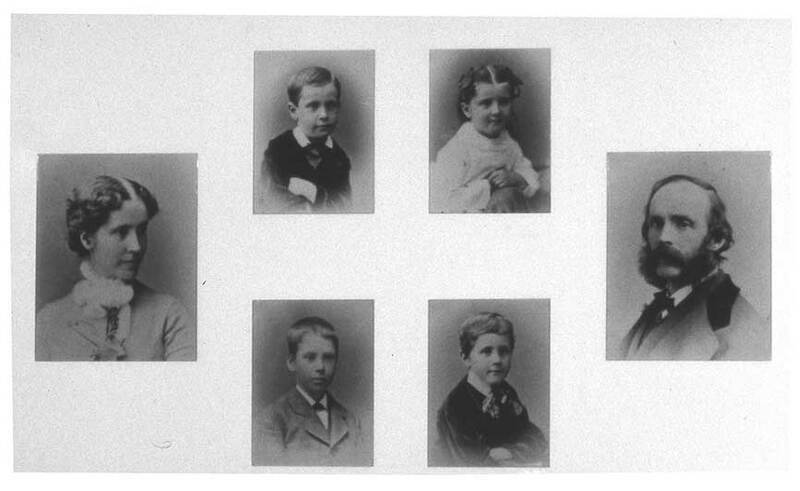 The Church family around 1875. Children photographed by Frank Forshew. Composite photograph by New York State Office of Parks, Recreation and Historic Preservation. Photographs collection of Olana State Historic Site As the family was growing, Frederic Church worked with architect and friend Calvert Vaux to design and build a large new house. The family moved into the house in the fall of 1872, although completion of its many decorative elements took a few more years. The children were educated at home, by Isabel with the help of tutor. The family’s large library includes grammar school texts, while carefully labeled botanical specimens and an egg collection testify to the children’s studies and outdoor life. When they got older, the children went off to boarding schools; the boys attended St Paul’s in Concord, New Hampshire, while Downie attended Miss Porter’s School in Farmington, Connecticut. Frederic and Winnie went on to Princeton. Why is this place called Olana? For many years, the Churches called their property simply “the Farm.” The name Olana first appeared written “Olâna” as the heading of a letter written by Isabel Church. A contemporary newspaper article credited her as the originator of the name, explained as “the old Latin name for a place in Persia, to which the artist’s home bears some resemblance in situation.” Scholars have linked the name to a translated volume of Strabo’s Geographica, a Christmas gift from Isabel to Frederic in 1879. Strabo’s publication describes the geography of the Roman Empire and references the city “Olane,” as one of the “treasure-storehouses” on the Araxes River, which offered a view of Mount Ararat, where Noah’s ark was said to rest. It is likely that the Churches appreciated the associations this name had to their own Persian-inspired stone “fortress” situated high above the Hudson River with majestic views west to America’s promised land. Frederic and Isabel and their four children centered their lives at Olana, and brought distinguished guests to visit. Samuel Clemens (better known as Mark Twain) read poetry, Robert and Emily de Forest photographed the interiors of the mansion as well as the grounds, and travel writer and bon vivante Susan Hale performed a charade, with the help of the Church family coachman, Michael McKenna, to the delight of all. The documents recording all these events survive at Olana. Throughout the 1890s Frederic and Isabel Church continued to make Olana their primary home. As they aged they suffered various ailments. Frederic Church’s rheumatism worsened, making painting difficult, while Isabel Church experienced bouts of depression, degenerating eyesight and general weakness. Frederic Church found that travel to a warm, dry climate helped his symptoms, and he spent many winters in Mexico. Isabel often traveled with him, but she also sought relief in the warm humidity of the seashore. The couple also spent extended periods of time in the home of William and Virginia Osborn in New York City, and both died there; Isabel on May 12, 1899 and Frederic on April 7, 1900.